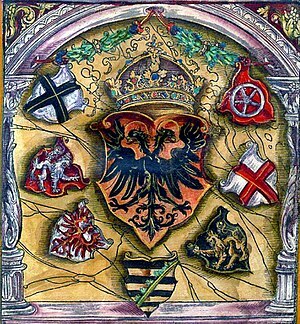 Coats of arms of prince electors surrounding the double-headed Reichsadler (1545). Imperial Habsburg coat of arms, for Rudolf II, from Siebmachers Wappenbuch (1605). 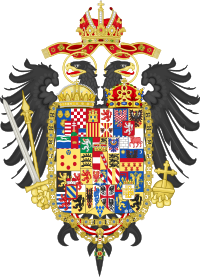 The surrounding coats of arms represent Habsburg possessions, the inescutcheon exceptionally combines the Austrian and Castilian arms, for Habsburg Austria and Habsburg Spain. The Reichsadler ("Imperial Eagle") was the heraldic eagle, derived from the Roman eagle standard, used by the Holy Roman Emperors and in modern coats of arms of Germany, including those of the Second German Empire (1871–1918), the Weimar Republic (1919–1933) and the "Third Reich" (Nazi Germany, 1933–1945). The same design has remained in use by the Federal Republic of Germany since 1945, but under a different name, now called Bundesadler ("Union Eagle" or "Federal Eagle", from German "Bund", genitive form "Bundes" meaning 'Union' or 'Federation', and "Adler" meaning 'Eagle'). The Quaternion Eagle, hand-coloured woodcut (c. 1510) by Hans Burgkmair. Direct attestations of imperial coats of arms become available in the later 13th century. Past emperors are given attributed arms in 13th-century sources. 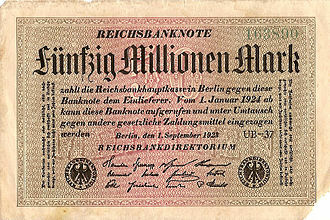 Thus, Otto IV is given the first known depiction of a double-headed Reichsadler in the Chronica Majora (ca. 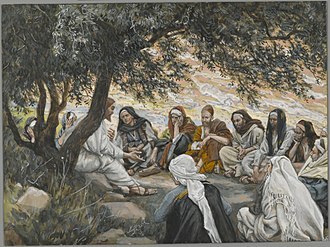 1250). Henry VI is given a (single-headed) Reichsadler in the Codex Manesse (c. 1320). Frederick II of Hohenstaufen (Emperor 1220–1250) did not use coats of arms in any of his seals. He did use the imperial eagle on some of his coins, but not displayed as a heraldic charge in a heraldic shield. Frederick's son and co-ruler Henry did have an equestrian seal with the Hohenstaufen coat of arms of three leopards, and this coat of arms is later attributed to Frederick II as well. From the reign of Albert II (reigned 1438–39, was never crowned emperor), each Emperor bore the old Imperial arms (Or, an eagle displayed sable beaked and membered gules) with an inescutcheon of pretence of his personal family arms. This appears therefore as a black eagle with an escutcheon on his breast. Before 1438 the Emperors used separate personal and an imperial coat of arms. The arms of the High Offices of the Empire were borne as an augmentation to the office-holder's personal arms. Barry of ten argent and azure, a lion rampant gules crowned or. Fusilly bendwise argent and azure. Gules a lion rampant argent, queue fourchée crossed in saltire, armed, langued, and crowned Or. Quarterly, I and IV gules a lion rampant argent, queue fourchée crossed in saltire, armed, langued, and crowned Or (for Bohemia); II and III barry of eight, gules and argent (for Hungary). Per pale, dexter gules a fess argent (for Austria); sinister bendy of six Or and azure, a bordure gules (for the French Duchy of Burgundy). Quarterly: I and IV grand-quarterly i and iv great-grand-quarterly 1 and 4 gules a three towered castle Or masoned sable and ajouré azure (for Castile), 2 and 3 argent a lion rampant purpure crowned Or langued and armed gules (for Leon), ii per pale, dexter per fess, in chief Or four pallets gules (for Aragon), in base gules a cross, saltire, and orle of chains linked together Or and a centre point vert (for Navarre), sinister argent a cross potent and four crosslets Or (for Jerusalem) impaling barry of eight gules and argent (for Hungary), iii per pale, dexter per fess, in chief Or four pallets gules (for Aragon), in base gules a cross, saltire, and orle of chains linked together Or and a centre point vert (for Navarre), sinister per saltire, 1 and 4 Or four pallets gules, 2 and 3 argent an eagle displayed sable (for Sicily); II and III grand-quarterly, i gules a fess argent (for Austria), ii azure semy-de-lis Or a bordure compony argent and gules (new Burgundy), iii bendy of six Or and azure a bordure gules (old Burgundy), iv sable a lion rampant Or langued and armed gules (for Brabant), overall at the fess point of the quarter an inescutcheon Or a lion rampant sable armed and langued gules (for Flanders) impaling argent an eagle displayed gules, armed, beaked, and langued Or (for Tyrol); enté en point argent a pomegranate proper seeded gules, supported, sculpted and slipped vert (for Granada). Quarterly, I and IV gules a lion rampant argent, queue fourchée crossed in saltire, armed, langued, and crowned Or (for Bohemia); II and III barry of eight, gules and argent (for Hungary); overall and inescutcheon per pale, dexter gules a fess argent (for Austria), sinister bendy of six Or and azure, a bordure gules (for Burgundy). Quarterly, I gules a lion rampant argent, queue fourchée crossed in saltire, armed, langued, and crowned Or (for Bohemia); II barry of eight, gules and argent (for Hungary); III per pale, dexter gules a fess argent (for Austria), sinister bendy of six Or and azure, a bordure gules (for Burgundy); IV grand-quarterly i and iv gules a three-towered castle Or (for Castile), ii and iii argent a lion rampant purpure armed, langued, and crowned Or (for Leon). Quarterly, I gules a lion rampant argent, queue fourchée crossed in saltire, armed, langued, and crowned Or (for Bohemia); II barry of eight, gules and argent (for Hungary); III grand-quarterly, i and iv gules a three-towered castle Or (for Castile), ii and iii argent a lion rampant purpure armed, langued, and crowned Or (for Leon); IV per pale, dexter bendy of six Or and azure a bordure gules (for Burgundy), sinister per fess, chief argent an eagle displayed gules armed, langued, and beaked Or (for Tyrol), and base Or a lion rampant sable, armed and langued gules (for Flanders); overall an inescutcheon gules a fess argent (for Austria). Quarterly, I barry of eight, gules and argent (for Hungary); II gules a lion rampant argent, queue fourchée crossed in saltire, armed, langued, and crowned Or (for Bohemia); III per pale, dexter gules a fess argent (for Austria), sinister bendy of six Or and azure, a bordure gules (for Burgundy); IV grand-quarterly i and iv gules a three-towered castle Or (for Castile), ii and iii argent a lion rampant purpure armed, langued, and crowned Or (for Leon). Quarterly, I gules a three-towered castle Or (for Castile); II barry of eight, gules and argent (for Hungary); III per pale, dexter Or four pallets gules (for Aragon), sinister per saltire i and iv Or four pallets gules, ii and iii argent an eagle displayed sable (for Sicily); IV per pale, dexter gules a fess argent (for Austria), sinister bendy of six Or and azure a bordure gules (for Burgundy); overall an inescutcheon gules a lion rampant argent, queue fourchée crossed in saltire, armed, langued, and crowned Or (for Bohemia). Quarterly, I and IV fusilly bendwise argent and azure (for Bavaria); II and III sable a lion rampant Or, armed, langued, and crowned gules (for the Electorate of the Palatinate); overall an inescutcheon gules an orb Or (for Arch-Steward of the Holy Roman Empire). Quarterly, I barry of eight gules and argent (for Hungary) impaling azure semy-de-lis Or a label gules (for Naples); II argent a cross potent and four crosslets Or (for Jerusalem) impaling Or four pallets gules (for Aragon); III azure semy-de-lis Or a bordure gules (for the House of Valois-Anjou) impaling azure a lion sinister rampant Or, armed, langued, and crowned gules (for Guelders); IV Or a lion rampant sable, armed and langued gules (for Jülich) impaling azure crusilly fitchy, two barbels haurient addorsed Or (for Bar); overall an inescutcheon Or a bend gules three alerions argent (for Lorraine) impaling Or, in annulo six torteaux, the torteau in chief replaced by a roundel azure charged with three fleurs-de-lis Or (for the Medici family). Quarterly, I barry of eight, gules and argent, impaling gules a patriarchal cross argent on a trimount vert (for Hungary); II gules a lion rampant argent, queue fourchée crossed in saltire, armed, langued, and crowned Or (for Bohemia); III bendy of six Or and azure, a bordure gules (for Burgundy); IV Or, in annulo six torteaux, the torteau in chief replaced by a roundel azure charged with three fleurs-de-lis Or (for the Medici family); overall and inescutcheon gules a fess argent (for Austria) impaling Or a bend gules three alerions argent (for Lorraine). Quarterly, I barry of eight, gules and argent, impaling gules a patriarchal cross argent on a tri-mount vert (for Hungary); II gules a lion rampant argent, queue fourchée crossed in saltire, armed, langued, and crowned Or (for Bohemia); III bendy of six Or and azure, a bordure gules (for Burgundy); IV azure crusilly fitchy, two barbels haurient addorsed Or (for Bar); overall an inescutcheon per pale, dexter Or a bend gules three alerions argent (for Lorraine), sinister Or, in annulo six torteaux, the torteau in chief replaced by a roundel azure charged with three fleurs-de-lis Or (for the Medici family), overall on a pale gules a fess argent (for Austria). Azure two sceptres in saltire Or. Gules, the imperial crown proper. Per fess sable and argent, two swords in saltire gules. The seven Electors named in the Golden Bull of 1356 were: the Prince-Bishops of Cologne, Mainz and Trier, the King of Bohemia, the Count Palatine of the Rhine, the Duke of Saxony and the Margrave of Brandenburg. The Count Palatine was replaced by the Duke of Bavaria in 1623, as the Elector Palatine, Frederick V, came under the imperial ban after participating in the Bohemian Revolt. The Count Palatine was granted a new electorate in 1648. 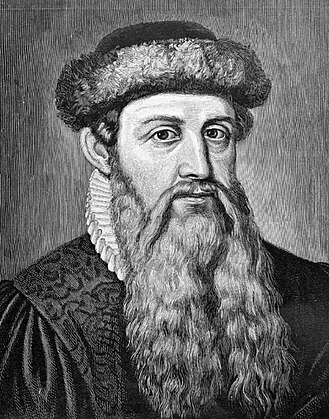 Saxony was held by a Protestant elector from 1525 (John), the Palatinate from 1541 (Otto Henry). In 1685, a Catholic branch of the Wittelsbach family inherited the Palatinate and a new Protestant electorate was created in 1692 for the Duke of Brunswick-Lüneburg, who became known as the Elector of Hanover (officially confirmed by the Imperial Diet in 1708). The Elector of Saxony (Augustus II) converted to Catholicism in 1697 so that he could become King of Poland, but no additional Protestant electors were created, and the Electorate itself remained officially Protestant. Gules, a wheel with six spokes argent. 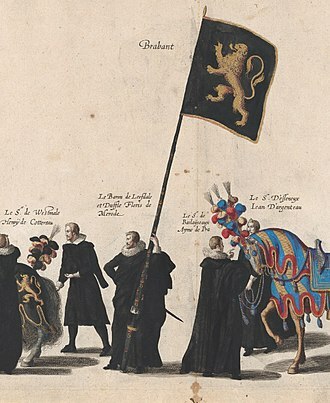 Before 1623: Sable a lion rampant Or crowned gules. From 1648 (Charles I Louis): Quarterly, I and IV fusilly bendwise argent and azure (for Bavaria); II and III sable a lion rampant Or, armed, langued, and crowned gules. Argent an eagle displayed gules crowned Or. Barry sable and Or, a crancelin rampant vert. Per pale, I Gules two lions passant guardant Or (for Brunswick), II Or a semy of hearts Gules a lion rampant Azure (for Lüneburg). After 1714: Laid on Royal coat of arms of the United Kingdom. Entries are listed by Imperial Circle (introduced 1500, 1512) even for territories that ceased to exist prior to 1500. Or three lions passant sable armed and langued gules impaling gules a fess argent. Argent an eagle displayed azure, armed, beaked, and langued gules, charged with a crescent chequy gules and Or. Azure an eagle displayed Or. Vert, a panther rampant argent incensed proper. Argent an eagle displayed gules, armed, beaked, and langued Or. Simple form: Fusily bendwise, azure and argent. Electorate, from 1753: Quarterly: fusily bendwise azure and argent; and sable, a lion rampant Or, armed and langued gules (for the Electorate of the Palatinate); with an escutcheon: gules, an orb Or. Gules, a horse springing argent, bridled argent. Quarterly: I and IV gules, an oak branch with acorns Or; II and III Or, a hops branch vert; an inescutcheon argent a fess azure. Gules, two keys in saltire argent. Party per pale: Or a lion rampant sable, armed and langued gules; and gules a fess argent. Before 1280: Gules an eagle displayed argent. After 1280: Azure billetty Or a lion rampant of the same, armed and langued gules. Before 1288: Sable a lion rampant Or, armed and langued gules. From 1288 to 1406: Quarterly, I and IV sable a lion rampant Or, armed and langued gules; II and III argent a lion rampant gules, queue fourchée, armed and langued Or. From 1406 to 1430: Quarterly, I and IV azure three fleur-de-lis Or, a bordure compony argent and gules; II sable a lion rampant Or, armed and langued gules; III argent a lion rampant gules, queue fourchée, armed and langued Or. Or a lion rampant sable. Before 1236: Or three cinquefoils gules. From 1236 to 1276: Azure billetty Or a lion rampant of the same. From 1276 to 1378: Azure a lion rampant Or, armed, langued, and crowned gules. After 1378: Azure a lion sinister rampant Or, armed, langued, and crowned gules, impaling Or a lion rampant sable, armed and langued gules. Before 1299: Chevronny Or and sable. From 1299 to 1254: Quarterly, I and IV Or a lion rampant sable, armed and langued gules; II and III Or a lion rampant gules, armed and langued azure. From 1254 to 1433: Quarterly, I and IV fusilly bendwise argent and azure; II and III grand-quarterly I and IV Or a lion rampant sable, armed and langued gules; II and III Or a lion rampant gules, armed and langued azure. Or a lion rampant gules, armed and langued azure. Before 1214: Argent a lion rampant gules, armed and langued Or. After 1214: Argent a lion rampant gules, queue fourchée, armed, langued, and crowned Or. Counts of Loon: Barry of ten, Or and gules. Counts of Chiny: Gules crusily fitchy, two barbels haurient addorsed Or. Counts of Loon and Chiny: Barry of ten Or and gules, impaling gules crusily fitchy, two barbels haurient addorsed Or. Counts of Loon and Chiny of the Heinsberg dynasty: Quarterly, I and IV gules a lion rampant argent, queue fourchée crossed in saltire; II and III barry of ten Or and gules impaling gules crusily fitchy two barbels haurient addorsed Or. Counts of Loon and Chiny of the Montferrat-Oreye dynasty: Quarterly, I and IV argent a lion rampant sable; II and III barry of ten Or and gules impaling gules crusily fitchy two barbels haurient addorsed Or. Until 1282 and after 1288: Barry of ten argent and azure, a lion rampant gules, armed, langued, and crowned Or. From 1282 to 1288: Barry of ten argent and azure, a lion rampant queue fourchée crossed in saltire gules, armed, langued, and crowned Or. Or, a lion rampant sable, armed and langued gules, a bend overall of the same. Or, a lion rampant armed and langued gules, overall a ribband argent. Party per fess gules and argent, three six-pointed mullets counterchanged. Argent, two lions passant guardant sable, langued gules. Party per fess: fusily argent and azure; and Or, a lion statant gules, atop a mount azure. Or, a double-headed eagle sable dimidiating bendy gules and argent. Quarterly: chevrony Or and gules; and barry Or and gules; overall a Wheel of Mainz argent. Argent, a double-towered castle gules. Quarterly: paley azure and argent; Or, a raven pecking the eye out of a Turk's head couped at the neck proper. Azure an eagle displayed argent. Argent, three pallets azure, a bend sinister wavy Or. Gules, a castle argent, portcullised Or, with an escutcheon of the Imperial arms (Or, a double-headed eagle sable) at the honour point. Argent, a pine tree on a mount Vert. Party per fess: Or, a demi-eagle displayed sable; and azure three roses argent. Gules, a lion passant reversed Or, crowned Or; with three stems of grass surtout, all on a mount Vert. Argent, an eagle sable, armed and langued Or, with a W Or on the breast. Argent a Celtic cross sable; a chief dancetty gules (de). Cleves dynasty: Gules, an escutcheon argent, overall an escarbuncle Or. Mark dynasty: Quarterly, I and IV gules an escutcheon argent, overall an escarbuncle Or; II and III Or a fess chequy argent and gules. Argent a lion rampant gules, queue fourchée crossed in saltire, armed, langued, and crowned Or. Or a lion rampant sable, armed and langued gules. Quarterly: I: gules a fess argent; II: Argent, three lions rampant vert, crowned or, armed and langued gules; III: Barry gules and or; IV: Or, three hunting horns gules, hooped and belted argent. Overall an inescutcheon gules, a perron or, supported by three lions, surmounted by a pineapple and a cross pattée, with the capital letters L and G aside, all of the same. Counts of Mark: Or a fess chequy gules and argent. Counts of Cleves and Mark: Quarterly, I and IV gules an escutcheon argent, overall an escarbuncle Or; II and III Or a fess chequy gules and argent. Azure a lion rampant barry argent and gules. Before 1430: Or a bend gules three alerions displayed argent. From 1430 to 1473: Quarterly of six, I barry of eight gules and argent (for Hungary); II azure semy-de-lis Or a label gules (for Naples); III argent a cross potent and four crosslets Or (for Jerusalem); IV azure semy-de-lis Or a bordure gules (for the House of Valois-Anjou); V azure crusilly fitchy, two barbels haurient addorsed Or (for Bar); VI Or a bend gules three alerions argent (for Lorraine); overall an inescutcheon Or four pallets gules (for Aragon). From 1473 to 1508: Quarterly, I barry of eight gules and argent impaling azure semy-de-lis Or a label gules; II argent a cross potent and four crosslets Or impaling Or four pallets gules; III azure semy-de-lis Or a bordure gules; IV azure crusilly fitchy, two barbels haurient addorsed Or; overall an inescutcheon Or a bend gules three alerions argent. From 1538 to 1737: Quarterly, I barry of eight gules and argent impaling azure semy-de-lis Or a label gules; II argent a cross potent and four crosslets Or impaling Or four pallets gules; III azure semy-de-lis Or a bordure gules impaling azure a lion sinister rampant Or, armed, langued, and crowned gules (for Guelders); IV Or a lion rampant sable, armed and langued gules (for Jülich) impaling azure crusilly fitchy, two barbels haurient addorsed Or; overall an inescutcheon Or a bend gules three alerions argent. Before 1346: Barry of ten, argent and sable. From 1386 to 1473: Or, on a bend gules three alerions argent, overall a label azure. Gules, three estoiles Or voided; on a chief Or three torteaux. Gules, a hunting horn argent, bound Or. Before 1214: Sable a lion rampant Or crowned gules. After 1214: Quarterly, I and IV fusilly bendwise argent and azure (for Bavaria); II and III sable a lion rampant Or, armed, langued, and crowned gules. Quarterly: argent, two sceptres Or in saltire, tipped with fleurs-de-lys Or, overall a tower gules, ajouré azure; and Or a lion gules, crowned, armed and langued azure; overall an escutcheon: azure, a badger argent. Barry sable and Or, a crancelin vert. Argent, a lion rampant queue forchée, armed, langued and crowned Or. Azure an eagle displayed chequy argent and gules, crowned Or. Per fess, chief gules a lion rampant argent, armed, langued, and crowned Or; base argent. Lower Lusatia: Argent, a bull rampant gules. Upper Lusatia: Per fess embattled, azure and Or. Upper Silesia: Azure, an eagle displayed Or, armed and langued Or. Lower Silesia: Or, an eagle displayed sable, armed and crowned Or and langued gules, charged on the breast with a crescent terminating in trefoils at each end with issuing from the centrepoint a cross patée argent. Or a cross quarter-pierced azure. Argent, an eagle displayed crowned gules standing upon three rocks sable issuing from the sea azure issuing from the base. 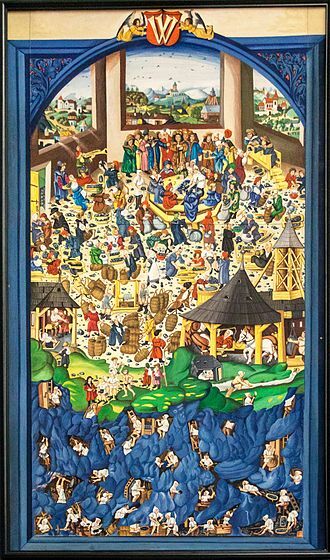 Before 1245: Or four pallets gules. After 1245: Azure semy-de-lis Or, a label gules. Argent, an eagle displayed sable crowned Or. Grand Master: Argent, on a cross sable a cross floretty Or and overall on an inescutcheon Or an eagle displayed sable. Or, a dolphin haurient azure finned gules. 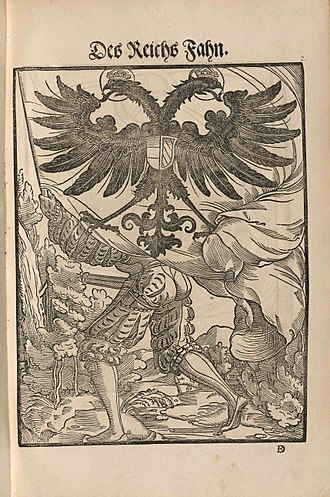 Wikimedia Commons has media related to Scheibler Armorial. ^ a b c d e "Bernhard Peter Monographien: Wappen der Bistümer". Retrieved 2007-11-14. ^ "Die Wappen der Landkreise". Archived from the original on 2007-11-17. Retrieved 2007-11-14. ^ "Königreich Böhmen". Retrieved 2007-11-14. 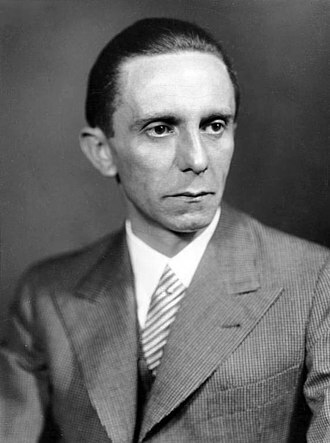 ^ a b "Kultur und Geschichte". Friedelsheim in der Pfalz. Retrieved 2007-11-14. Henry VII was the King of Germany from 1308 and Holy Roman Emperor from 1312. He was the first emperor of the House of Luxembourg, born around 1275 in Valenciennes, he was a son of Count Henry VI of Luxembourg and Béatrice from the House of Avesnes. Raised at the French court, he was the lord of comparatively small properties in a peripheral and predominantly French-speaking part of the Holy Roman Empire. It was symptomatic of the weakness that during his rule as the Count of Luxembourg, he agreed to become a French vassal. 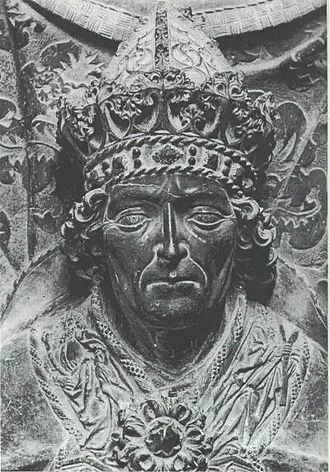 During his rule of Luxembourg, he ruled effectively, especially in keeping the peace in local feudal disputes, Henry became caught up in the internal political machinations of the Holy Roman Empire with the assassination of King Albert I on 1 May 1308. Almost immediately, King Philip of France began aggressively seeking support for his brother, Charles of Valois, Philip thought he had the backing of the French Pope Clement V, and that his prospects of bringing the empire into the orbit of the French royal house were good. He lavishly spread French money in the hope of bribing the German electors, although Charles of Valois had the backing of Henry, Archbishop of Cologne, a French supporter, many were not keen to see an expansion of French power, least of all Clement V. The principal rival to Charles appeared to be Rudolf, the Count Palatine, Henry of Cologne’s brother, Archbishop of Trier, won over a number of the electors, including Henry, in exchange for some substantial concessions. 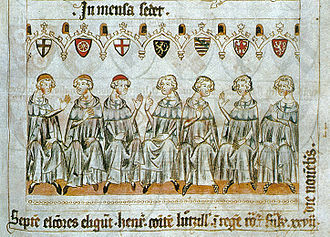 Consequently, Henry skillfully negotiated his way to the crown, elected with six votes at Frankfurt on 27 November 1308, Henry was subsequently crowned at Aachen on 6 January 1309. 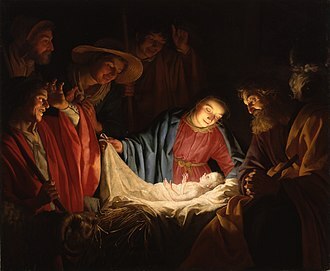 In July 1309, Pope Clement V confirmed Henrys election and he agreed to crown Henry Emperor at Candlemas 1312personally, the title having been vacant since the death of Frederick II. Yet the newly crowned king had local issues to deal with before he could seek the imperial crown, Henry was approached by part of the Bohemian nobility and some important and influential ecclesiastics to intervene in Bohemia. 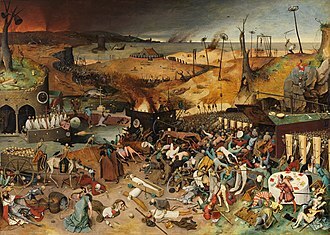 In July 1310 he engineered the removal of Henry of Carinthia and he therefore confirmed them in their imperial fiefs by October 1309, in exchange, Leopold of Habsburg agreed to accompany Henry in his Italian expedition, and to provide a body of troops as well. He saw it, together with the crowns of Italy and Arles and it was hoped that this would lessen the tensions in Italy between the anti-imperial Guelphs, who looked to the King of Naples for leadership, and the pro-imperial Ghibellines. Negotiations broke down due to Robert’s excessive monetary demands, as well as through the interference of Philip, while these negotiations were taking place, Henry began his descent into northern Italy in October 1310, with his eldest son John remaining in Prague as the Imperial vicar. 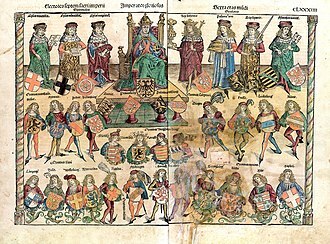 As Emperor, Henry had planned to restore the glory of the Holy Roman Empire, each of these contests had created bitter losers, each of whom looked to the emperor-elect for restitution. 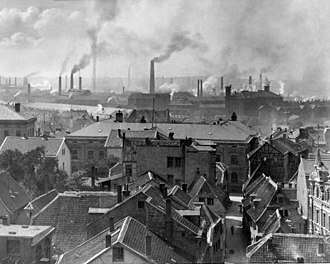 Henry expressed both his high-minded idealism and lack of craft in his plan to require all the cities of Lombardy to welcome back their exiles. Attributed arms are Western European coats of arms given retrospectively to persons real or fictitious who died before the start of the age of heraldry in the latter half of the 12th century. Arms were assigned to the knights of the Round Table, and to biblical figures, to Roman and Greek heroes, each author could attribute different arms for the same person, but the arms for major figures soon became fixed. 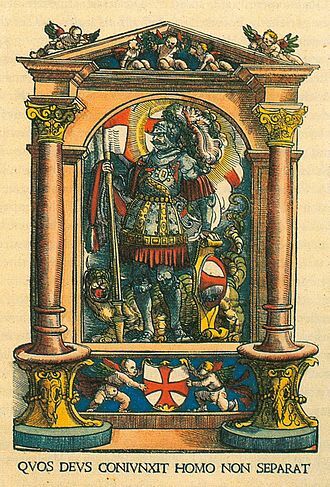 Notable arms attributed to biblical figures include the arms of Jesus based on the instruments of the Passion, medieval literature attributed coats of arms to the Nine Worthies, including Alexander the Great, Julius Caesar, and King Arthur. Arms were given to many kings predating heraldry, including Edward the Confessor and these attributed arms were sometimes used in practice as quarterings in the arms of their descendants. 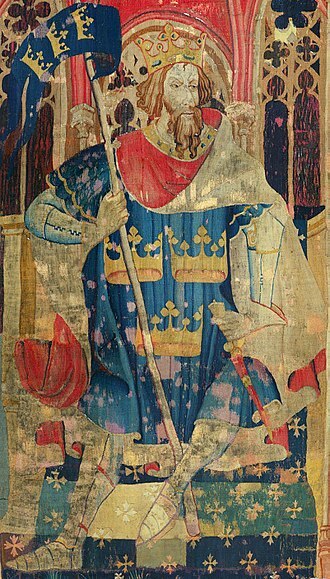 Attributed or imaginary arms appeared in literature in the middle of the 12th century, during the generation following Chrétien de Troyes, about 40 of Arthurs knights had attributed coats of arms. A second stage of development occurred during the 14th and 15th centuries when Arthurian arms expanded to include as many as 200 attributed coats of arms, during the same centuries, rolls of arms included invented arms for kings of foreign lands. Around 1310, Jacques de Longuyon wrote the Voeux de Paon and this list, divided into three groups of three, became known in art and literature as the Nine Worthies. Each of the Nine Worthies were given a coat of arms, King David, for instance, was assigned a gold harp as a device. Once coats of arms were the fashion of the ruling class. In such an era, it was enough to consider that suitable armorial devices. Each author could attribute different arms for the person, although regional styles developed. Some attributed arms were incorporated into the quarterings of their descendants arms, the quarterings for the family of Lloyd of Stockton, for instance, include numerous arms originally attributed to Welsh chieftains from the 9th century or earlier. In a similar vein, arms were attributed to Pope Leo IX based on the arms of his familys descendants. The Hohenstaufen, called the Staufer or Staufen, were a dynasty of German kings during the Middle Ages. Besides Germany, they ruled the Kingdom of Sicily. In Italian historiography, they are known as the Svevi, since they were dukes of Swabia from 1079, three members of the dynasty—Frederick I, Henry VI and Frederick II—were crowned Holy Roman Emperor. The name Staufen derives from Stauf, meaning chalice, and was applied to conical hills in Swabia in the Middle Ages. The family derives its name from the castle which the first Swabian duke of the lineage built there in the half of the 11th century. Staufen castle was finally called Hohenstaufen by historians in the 19th century. The name of the dynasty followed, but in recent decades the trend in German historiography has been to prefer the name Staufer, the noble family first appeared in the late 10th century in the Swabian Riesgau region around the former Carolingian court of Nördlingen. A local count Frederick is mentioned as progenitor in a pedigree drawn up by Abbot Wibald of Stavelot at the behest of Emperor Frederick Barbarossa in 1153. He held the office of a Swabian count palatine, his son Frederick of Buren married Hildegard of Egisheim-Dagsburg and their son Frederick I was appointed Duke of Swabia at Hohenstaufen Castle by the Salian king Henry IV of Germany in 1079. 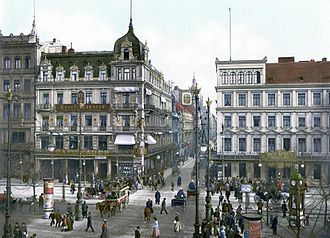 At the same time, Duke Frederick I was engaged to the kings approximately seventeen-year-old daughter, Fredericks brother Otto was elevated to the Strasbourg bishopric in 1082. Upon Fredericks death, he was succeeded by his son, Duke Frederick II, Frederick II remained a close ally of the Salians, he and his younger brother Conrad were named the kings representatives in Germany when the king was in Italy. Around 1120, Frederick II married Judith of Bavaria from the rival House of Welf, when the last male member of the Salian dynasty, Emperor Henry V, died without heirs in 1125, a controversy arose about the succession. A civil war between Fredericks dynasty and Lothairs ended with Fredericks submission in 1134, after Lothairs death in 1137, Fredericks brother Conrad was elected King as Conrad III. The coat of arms of Germany displays a black eagle with red feet and tongue on a golden field, blazoned, Or, an eagle displayed sable beaked langued and membered gules. This is the Bundesadler or Federal Eagle, formerly the Reichsadler or Imperial Eagle and it is a re-introduction of the coat of arms of the Weimar Republic adopted by the Federal Republic of Germany in 1950. The current official design is due to Tobias Schwab and was introduced in 1928, the single-headed Prussian Eagle was used as an escutcheon to represent the Prussian Kings as dynasts of the German Empire. 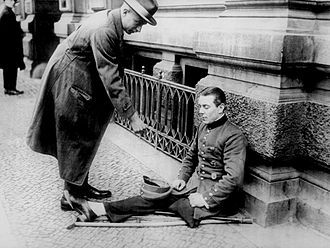 The Weimar Republic introduced a version in which the escutcheon and other symbols were removed. By the 13th century the coat of arms was generally recognised as, Or. During the medieval period the imperial eagle was usually single-headed, a double-headed eagle is attributed as the arms of Frederick II in the Chronica Majora. In 1433 the double-headed eagle was adopted by Sigismund, Holy Roman Emperor, thereafter the double-headed eagle was used as the arms of the German emperor, and hence as the symbol of the Holy Roman Empire of the German Nation. From the 12th century the Emperors used a coat of arms separate from the imperial arms. From the reign of Albert II, the Emperors bore the old Imperial arms with an inescutcheon of pretence of his family arms. 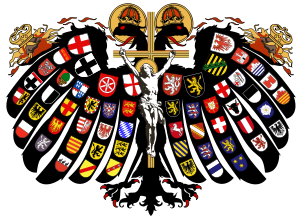 Coats of arms of the Holy Roman Empire In 1815, a German Confederation of 39 loosely united German states was founded on the territory of the former Holy Roman Empire, until 1848, the confederation did not have a coat of arms of its own. The Federal Diet meeting at Frankfurt am Main used a seal which carried the emblem of the Austrian Empire and it showed a black, double-headed eagle, which Austria had adopted just before the dissolution of the Holy Roman Empire of the German Nation. During the 1848 revolution, a new Reich coat of arms was adopted by the National Assembly that convened in St. Pauls Church in Frankfurt. The black double-headed eagle was retained, but without the four symbols of the emperor, the sword, the orb, the sceptre. The eagle rested on a shield, above was a five-pointed golden star. In heraldry and vexillology, the double-headed eagle is a charge associated with the concept of Empire. Most modern uses of the symbol are directly or indirectly associated with its use by the Roman/Byzantine Empire, whose use of it represented the Empires dominion over the Near East and the West. But the symbol itself is, in fact, much older, the eagle by itself has long been a symbol of power and dominion. The double-headed eagle motif appears to have its origin in the Ancient Near East. It re-appears in the High Middle Ages, from ca, in a few places, among them the Holy Roman Empire and Russia, the motif was further augmented to create the less prominent triple-headed eagle. Polycephalous mythological beasts are very frequent in the Bronze Age to Iron Age pictorial legacy of the Ancient Near East, especially in the Assyrian sphere, use of the double-headed eagle in Hittite imagery has been interpreted as royal insignia. A monumental Hittite relief of an eagle grasping two hares is found at the eastern pier of the Sphinx Gate at Alaca Hüyük. After the Bronze Age collapse, there is a gap of more than two millennia before the re-appearance of the double-headed eagle motif, the early Byzantine Empire continued to use the imperial eagle motif. A modern theory, forwarded by Zapheiriou, connected the introduction of the motif to Emperor Isaac I Komnenos, Zapheiriou supposed that the Hittite motif of the double-headed bird, associated with the Paphlagonian city of Gangra might have been brought to Byzantium by the Komnenoi. The double-headed eagle motif was adopted in the Seljuk Sultanate of Rûm, a royal association of the motif is suggested by its appearance on the keystone of an arch of the citadel built at Ikonion under Kayqubad I. The motif appears on Turkomen coins of this era, notably on coins minted under Artuqid ruler Nasir al-Din Mahmud of Hasankeyf. The oldest preserved depiction of an eagle in Serbia is the one found in the donor portrait of Miroslav of Hum in the Church of St. Peter and Paul in Bijelo Polje. The double-headed eagle in the Serbian royal coat of arms is attested in the 13th and 14th centuries. The same design has remained in use by the Federal Republic of Germany since 1945, but under a different name, now called Bundesadler. The Reichsadler can be traced back to the banner of the Holy Roman Empire and it was meant to embody the reference to the Roman tradition, similar to the double-headed eagle used by the Palaiologi emperors of the Byzantine Empire or the tsars of Russia. 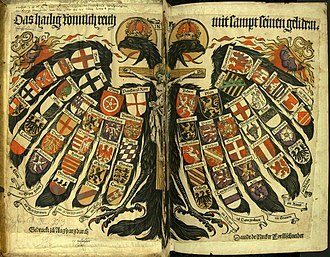 The Reichsadler was widely used by Imperial cities such as Lübeck, Besançon, the Teutonic Order under Hermann von Salza had the privilege to display the Imperial eagle in their coat of arms, granted by Emperor Frederick II. 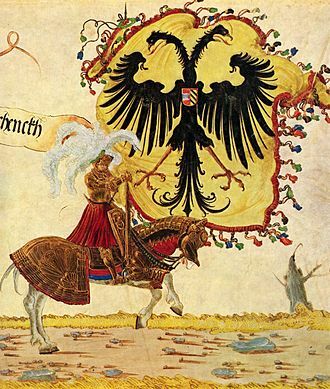 The black eagle was adopted when the Teutonic State was transformed into the Duchy of Prussia in 1525. Sigismund of Luxembourg used a black double-headed eagle after he was crowned Emperor in 1433, while the single-head eagle remained an ensign of the elected King of the Romans, since 1919 the coat of arms of Austria has depicted a single-headed eagle. 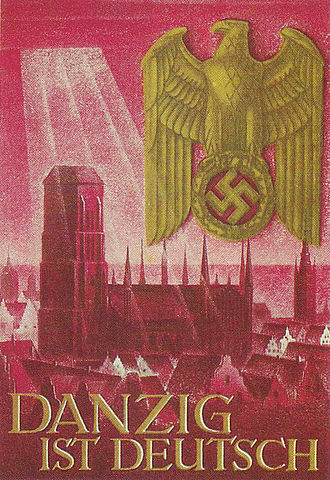 Although not a symbol in the modern sense, the Reichsadler evoked sentiments of loyalty to the empire. The eagle is used in heraldry as a charge, as a supporter, and as a crest. The eagle with its keen eyes symbolized perspicacity, courage and immortality, with these attributed qualities the eagle became a symbol of power and strength in Ancient Rome. The eagle as a symbol has a much longer than that of heraldry itself. In Ancient Egypt, the falcon was the symbol of Horus, an eagle appears on the battle standard of Cyrus the Great in Persia, around 540 BC. The eagle as an animal of the Roman Republic was introduced in 102 BC by consul Gaius Marius. According to Islamic tradition, the Black Standard of Muhammad was known as راية العُقاب rāyat al-uqāb banner of the eagle), in Christian symbolism the four living creatures of scripture have traditionally been associated with the Four Evangelists. The eagle is the symbol of Saint John the Evangelist, in medieval and modern heraldry eagles are often said to indicate that the armiger was courageous, a man of action and judicious. 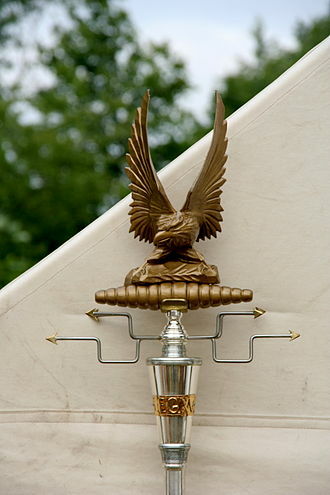 Where an eagles wings were spread it was said to indicate the role as a protector. In the same way that a lion is considered the king of beasts and it has been more widely used and more highly regarded in Continental European heraldry than in English heraldry. For instance, in the roll of Henry III of England there are only three eagles, media related to examples of heraldic eagles at Wikimedia Commons The depiction of the heraldic eagle is subject to a great range of variation in style. The eagle was far more common in continental European—particularly German—than English heraldry and it is often depicted membered / armed and langued gules, that is, with red claws / talons and tongue. In its relatively few instances in Gallo-British heraldry, the outermost feathers are typically longer, an eagle can appear either single- or double-headed. On at least one occasion a three-headed eagle is seen, recursant describes an eagle with his head turned to the sinister. In full aspect describes an eagle with his head facing the onlooker, in trian aspect describes when the eagles head is facing at a three-quarter view to give the appearance of depth – with the head cocked at an angle somewhere between profile and straight-on. In the Roman Catholic hierarchy, the Archbishop-Elector of Mainz was the Primate of Germany, a purely honorary dignity that was unsuccessfully claimed from time to time by other Archbishops. There were only two other ecclesiastical Prince-electors in the Empire, the Electorate of Cologne and the Electorate of Trier. 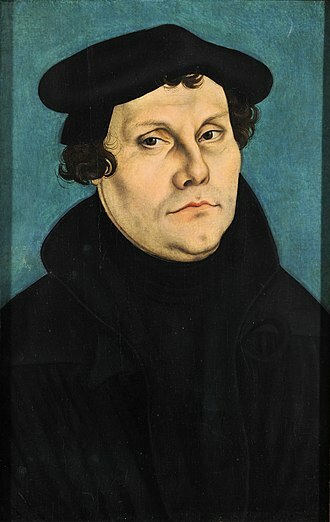 The Archbishop-Elector of Mainz was archchancellor of Germany and, as such, ranked first among all ecclesiastical and secular princes of the Empire and his political role, particularly as an intermediary between the Estates of the Empire and the Emperor, was considerable. The episcopal see was established in ancient Roman times in the city of Mainz, the first bishops before the 4th century have legendary names, beginning with Crescens. The first verifiable Bishop of Mainz was Martinus in 343, the ecclesiastical and secular importance of Mainz dates from the accession of St. Boniface to the see in 747. Boniface was previously an archbishop, but the honor did not immediately devolve upon the see itself until his successor Lullus, another early bishop of Mainz was Aureus of Mainz.